World stocks were mostly lower on Thursday ahead of the European Commission's economic forecasts. Germany reported its industrial production slipped 0.4 percent in December from the previous month, way below the 0.9 percent gain analysts had expected. The latest data follows a 1.6 percent decline in factory orders in December compared with a month earlier, raising fears Europe's largest economy is slowing. Germany's DAX dropped 0.5 percent to 11,265.02 and the CAC 40 in France shed 0.2 percent to 5,071.51. Britain's FTSE 100 edged 0.1 percent higher to 7,178.82, as traders focused on Prime Minister Theresa May's return to Brussels to seek assurances on an exit deal. Wall Street was set to open lower. The future contract for the Dow Jones Industrial Average lost 0.1 percent to 25,293.00. That for the S&P 500 shed 0.2 percent to 2,724.30. News that the Reserve Bank of Australia may cut interest rates boosted several Asian indexes. The Philippine central bank kept its rates intact after a meeting on Thursday, but India's central bank issued a surprise rate cut and changed its stance from "calibrated tightening" to neutral. When borrowing is made less expensive, the increase in spending by businesses and consumers could give the economy boost. The Bank of England is expected to announce it is keeping its policy rate unchanged in an announcement later Thursday. Japan's Nikkei 225 dropped 0.6 percent to 20,751.28 on concerns over U.S.-China relations. U.S. Treasury Secretary Stephen Mnuchin and trade representative Robert Lighthizer will lead a delegation to Beijing next week for the next round of trade talks, but the issues at hand are complex. These include contentious issues like Beijing's technology policy and trade practices, where progress has been limited so far. Mnuchin also said that there were no plans for President Donald Trump to meet Chinese leader Xi Jinping. "If there are remaining issues that we can't get closed, I think President Trump expects that he's going to sit down with President Xi and address those issues," he said. KEEPING SCORE: Australia's S&P ASX 200 gained 1.1 percent and New Zealand's NZX index advanced 0.7 percent. 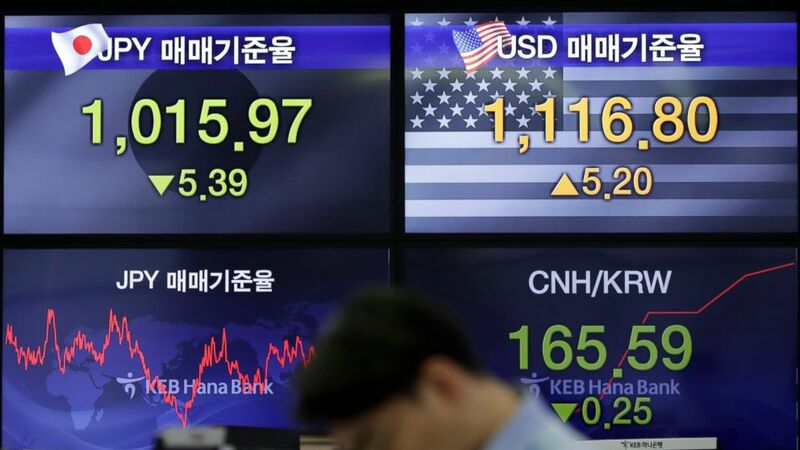 South Korea's Kospi was flat, while India's Sensex picked up 0.3 percent. Stocks rose in Singapore and the Philippines but fell in Thailand and Indonesia. Markets in China, Hong Kong and Taiwan were closed for Lunar New Year. ENERGY: U.S. crude lost 11 cents to $53.90 per barrel in electronic trading on the New York Mercantile Exchange. It gained 35 cents to settle at $54.01 per barrel in New York. Brent crude, used to price international oils, gave up 21 cents to $62.48 per barrel. It added 71 cents to close at $62.69 per barrel in London. CURRENCIES: The dollar eased to 109.97 yen from 109.99 yen late Wednesday. The euro slipped to $1.1340 from $1.1363. The British pound was trading at $1.2897, down from $1.2932.